No preamble today - straight to the review! 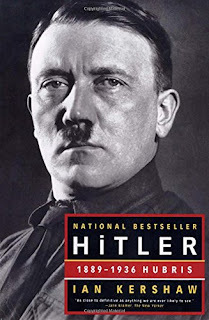 Hitler, Vol.1: 1889-1936 Hubris is the first of two volumes about the life of German Chancellor and eventual dictator Adolf Hitler, written by British historian Ian Kershaw. This first volume explores his life from the time he was born until the remilitarization of the Rhineland (an area Germany had been forced to demilitarize as part of the Treaty of Versailles in 1919) in early 1936. I've got a thing for history. I've had a thing for German history since I was a kid, and a thing for the time period between World War I and World War II since college. If you need any indication for how much of a thing it is - I did an independent study on it. This was one of the books I picked up to read as part of that independent study, but didn't get through before the end of the semester. When history is your major in college, you read a lot of things written by historians, and write a few things yourself. What you find out quickly is how dense the writing is, and how quickly you have to learn the art of skimming if you want to get the reading done in time for class. Because this biography is so comprehensive (it's been split into two volumes, and the first volume is 591 pages before the end notes and appendices), and the topic is so much to take in, I took an extra week to finish reading it. Before that last paragraph scares you off - this was soooo worth the time, in my opinion. Yeah, Hitler, Vol. 1 is long and comprehensive, but the language Kershaw uses is generally easy to understand, and active and engaging in the topic. His expertise is German social history in the 20th century, and both his knowledge and his passion for sharing what he knows bleed through the pages. The second volume is also sitting on my bookshelf, and while I may not get to the second volume until the end of this year or beginning of next year, I will not be skipping it. It was interesting to be reading this particular book at this particular moment in history. So much has been happening so fast, and so many people have things to say - polarizingly positive and negative. I was in the middle of reading this biography when a friend posted a link to an article about how our current president is not just like Hitler (points of which I both agreed and disagreed). I finished the book with a better perspective, I think, on what happened then versus what is happening in the USA now - which is why I firmly believe it is so important that we do not lose sight of what has happened in the past. It's one way we can recognize what is going on in the world and maybe, maybe see things go differently.